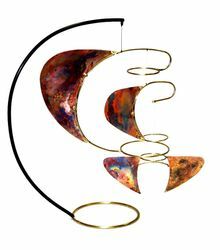 Our hanging metal mobiles can complement a traditional or contemporary space. The mobiles are finished in one of two ways: One method is to "heat-treat" the metal. By heating and rapidly cooling the metal we are able to bring out the deep reds, purples, blues and greens in the Copper. The second technique is to "hand-texture" the metals with a disk grinder...lightly cutting a pattern into the metal surface to create a highly reflective brushed surface. Both finishes are clear-coated with lacquer. Each mobile is signed and dated by the artist Joel Hotchkiss and is then carefully packed for shipping.